I just saw the trailer for Star Wars: Episode IX and, while it only runs 2:07 minutes, I found myself smiling, shaking, and crying as I watched it. There are so many little and rather big things crammed into those 127 seconds, including seeing an old friend and hearing an old enemy. I am cautiously optimistic, but this trailer suggests that there is much to look forward to in this final film that ends the current trilogy and the nine-movie Skywalker saga. First of all I started shivering when I saw the title – Star Wars: The Rise of Skywalker. If nothing else, this gives me a great deal of hope on a number of levels. For one, I never bought Kylo Ren’s (Adam Driver) story that Rey (Daisy Ridley) was a nobody as he tells her in The Last Jedi. This is a story I believe he concocts to get her to join him on the dark side of the Force. But the light shines in Rey, perhaps more so than even in young Luke (Mark Hamill) in A New Hope, so it is pretty clear that Rey is indeed somebody and that she will find out that she is a Skywalker. The title suggests someone new as a Skywalker – some people have even suggested that Broom Boy (the kid in the last scene of The Last Jedi) may have been unknowingly a Skywalker. My bet is that it is Rey because Luke’s lightsaber called to her so deeply in The Force Awakens, and from the trailer it appears that she has reconstructed it after it was destroyed in her duel with Kylo in The Last Jedi. That iconic blue lightsaber belongs in the hands of a Skywalker – it originally belonged to Luke’s father Anakin (Hayden Christensen and Jake Lloyd in the prequels) – so it makes sense that it will belong to Rey. How Rey is a Skywalker is interesting to think about because Anakin supposedly had no father and was born through the Force. His mother tells this story to Qui Gon Jin (Liam Neeson) in The Phantom Menace, so if we take this as truth there is a possibility that Rey too was born out of the Force, but to whom? Could she be a child Leia (Carrie Fisher) had when she was separated from Han? Or perhaps she is Luke’s child that he did not know about. Whatever is the case, JJ Abrams has an opportunity to make this an important aspect of the story line. 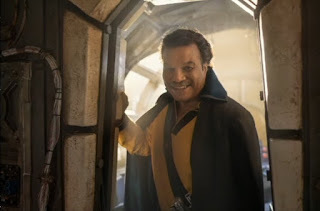 The trailer also reveals Billie Dee Williams as Lando Calrissian at the helm of the Millennium Falcon with Chewbaca (Joonas Suotamo) and this caused more shivers and shaking. 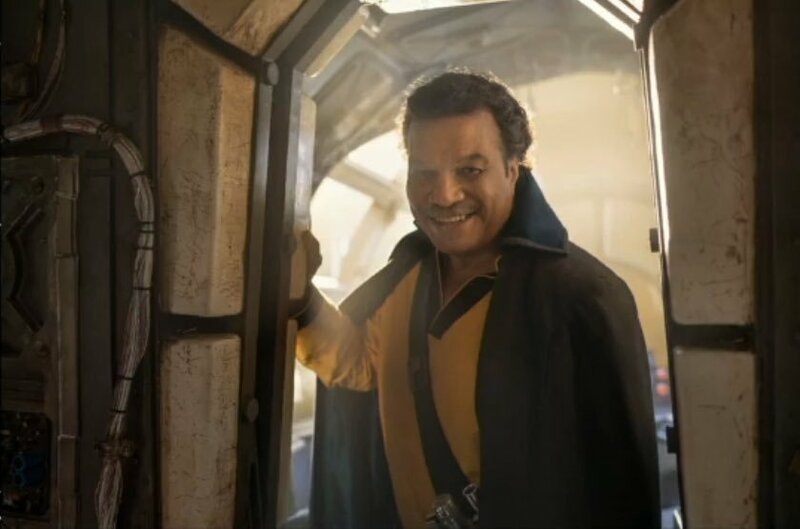 It is such a delight to see Williams as Lando, and the feeling for me is a real connection to the original trilogy that makes sense as the nine-movie saga comes to an end. There is also a scene where Rey, Poe Dameron (Oscar Issac), and Finn (John Boyega) come upon the remains of the crashed Death Star from Return of the Jedi. Talk about making connections with the original trilogy, this reminds us of how the Empire ended and the Rebel Alliance won; however, it is also how the First Order would get started. At the very end of the trailer the most haunting thing is not a visual but a sound – a very familiar and blood curdling one – Emperor Palpatine (the terrific Ian McDiarmid) laughing. JJ Abrams has confirmed Palpatine will be in The Rise of Skywalker, so we can all swallow that lump in our collective throats and wonder just how he will fit into the story. Never has a short trailer done so much to delight and scare me as this one has. Since standing on line as a teenager to see A New Hope to taking my kids to see the new films, I have felt deeply connected to the story. Even in the last films, to see Luke age as I have gives a deeper perspective and understanding to how much I feel for him and the other characters. Many people were upset when they believed Luke died at the end of The Last Jedi because they took it personally, as if they lost a member of their family. I am not the only one in my family to be excited about the trailer. I showed it to my son and his eyes glowed, and at the end when he heard Palpatine’s cackle, his eyes widened and he shouted, “The Emperor’s back!” Yes, the guy behind all the misery generated in the original films and the prequels is back – hopefully with a vengeance. Nothing would be more delightful than to see his Force ghost (I know, the Sith weren’t supposed to become Force ghosts, but you never know) battling Luke’s. It’s a long shot, but I can dream, right? The anticipation for this film will continue to grow, with no doubt more trailers coming out and toys appearing in stores and online. Sometimes the toys give us clues as to what characters will be in the films and their importance. Before The Last Jedi my son and I saw a nice action figure in the store of Supreme Leader Snoke (played by Andy Serkis), and we had high hopes that he would have a duel with Luke in the movie, but he was quickly dispatched in a disappointing scene, so a great toy doesn’t always connect to importance in the film. We should all be looking forward to all the things that will be coming our way about the film as we await its premier in December. For now, check out the trailer below.